Your success as a manager or supervisor will increase tremendously if you can skillfully deliver negative feedback with tact and respect for others’ dignity. Learn to offer constructive feedback while still keeping morale high on your team. The rules for management communications are changing rapidly with the adoption of new technology for communicating. Confrontational Communication by Dianna Booher is a handy management resource to communicate clearly, tactfully, and confidently in common problem situations. This series of quick tips is a credible guide to decisive communication, while also serving as a perfect resource for understanding the fast changing rules for mobile, social media, and digital communications on the go. Excellent communication skills are a key factor in effectively managing and leading. 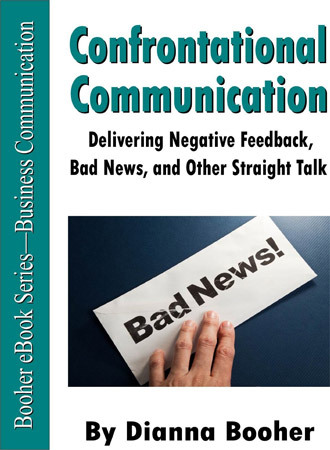 Confrontational Communication for managers and executives will take the guesswork out of how to deliver constructive feedback and any bad news to employees, customers, teams, and co-workers.